Breeding can be a quite complicated affair among birds, with nest site selection being of key importance in the process. Sometimes, the mere presence of an appropriate nesting place helps to bring birds into breeding condition. 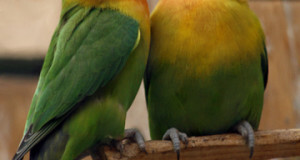 Conversely, a mated pair of birds may not reproduce if a favorable nest site is lacking. While some species will modify a nest box or site, others will not – an entrance hole that is too large, for example, may doom your breeding efforts to failure. All of the nests and nest boxes mentioned below have been carefully designed so as to meet the needs of a wide variety of birds. Selecting the model appropriate to the types of birds that you keep is the first step in becoming a successful breeder. 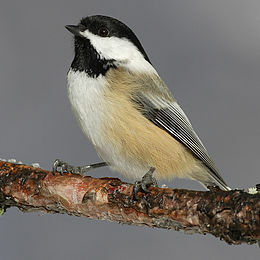 As mentioned, the introduction of a nest box or site may bring about an immediate breeding response in some species. This is most commonly seen among birds that, because they live in areas with harsh, unpredictable climates, must be ready to breed as soon as favorable conditions present themselves. 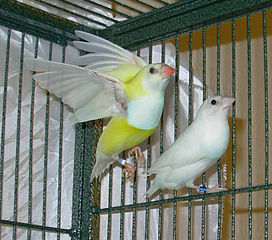 The cockatiel and budgerigar utilize this breeding strategy. An increase in humidity, simulated by a room humidifier, mist bottle or hose, is a breeding key for many birds. As the rainy season in nature usually brings with it a resurgence of plant growth, providing sprouting greens (using, for example, the VitaKraft Sprout Pot) as you increase humidity is always a good idea. Increasing the number of insects offered to finches and other softbills is a time-tested technique for bringing birds into breeding readiness. Novel insect foods, such as may appear at the beginning of the breeding season in nature, are, in my experience, particularly effective. In zoo collections and at home I have found it useful to add wild-caught insects to my birds’ diets at nesting time. The Zoo Med Bug Napper is a wonderfully suited to this purpose. I also suggest that you experiment with commercial species other than crickets and mealworms, such as canned grasshoppers and silkworms and live waxworms, roaches and earthworms. It is becoming increasingly apparent that full spectrum light in general, and Ultraviolet A light in particular, is a vital stimulus to normal behavior, including reproduction, in birds (and many other creatures). Always equip your bird’s cage or room with a full spectrum bulb designed specifically for birds, such as the Zoo Med Avian Sun UVB Bulb. Manipulating the length of your pet’s day/night cycle, in accordance with that of its natural habitat if possible, is also desirable, or even necessary for some species. Small, enclosed nest sites such as A&E Hanging Finch Nest with Leaves and Finch Nest in a House with Leaves are ideal for finches that naturally lay their eggs within tree cavities. Included among these are zebra finches and the various nuns and waxbills. Particularly choosy individuals may prefer with a piece of rolled cork bark over a traditional nesting hollow. Canaries, cordon blues and green singing fiches will readily occupy open nests. For these and similar birds, choose the A&E Small Natural Open Finch Nest or Pet’s International Stick Nature Nest. Larger tree-hole nesters, such as budgerigars and lovebirds, should be provided with the Hagen Parakeet and Lovebird Breeding Nest Box. A ready supply of the proper nesting material is an important factor in any breeding program. Some birds are particularly choosy in this regard, either on an individual or species basis. Certain species of hummingbird, for example, are most successful in constructing their walnut-sized nests when provided with mosses and lichens…even spider webs, much favored by free-living hummers, have their place as nesting material in zoo programs. If your birds will not nest and all else seems in order, try adding a variety of nesting material…as with the sudden appearance of novel insect food, this can be a powerful breeding stimulus. Eight-in-One Bird Nesting Hair and String fits the needs of most commonly-kept softbills. 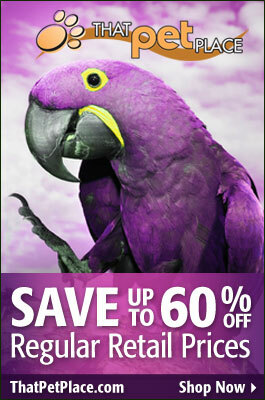 Don’t hesitate to experiment, and to consider products originally designed for pets other than birds. Some lovebirds add bark to their nests in the wild…for these you might try R-Zilla Douglas Fir Bark (marketed for reptiles). Most softbills will use at least some dry grass when constructing their nests – L&M Animal Super Alfalfa Bits (marketed for rabbits and other small animals) is popular with many birds (in zoos, birds of all types raid the alfalfa bails set out for deer and antelope). Small wild birds of many species utilize moss as a nest-lining. Most softbills and some lovebirds will appreciate R-Zilla Beaked Moss Bedding or Hagen Forest Plume Moss (marketed for amphibians). Hello Maria, Frank Indiviglio here. Thanks for your interest in our blog. Please let me know what further information you would like to receive or questions you may have about our products, and I’ll get right back to you. Look forward to hearing from you. Hello Karen, Frank Indiviglio here. Thanks for your interest in our blog. A Parakeet Nest Box with a translucent panel (for viewing) would be ideal for your pair of budgerigars. The nest box I referred you to is constructed with common budgerigars in mind…if you have another species, please let me know. Other supplies depend up your cage type, etc. Please write back with additional details as to what you are looking for and I’ll be happy to provide some suggestions. Good luck with your birds and please keep me posted.